November 17, 2017 - Today's adventure was another long drive into the Mojave Desert to see the Mitchell's Caverns near Essex, CA. Mitchell's Caverns are a trio of limestone caves, located at an elevation of 4300 ft., in the Providence Mountains State Recreation Area. The "Tecopa" (named for a Shoshone Indian chief) and "El Pakiva" (Devil's house) caves are connected by a man-made tunnel and are open to guided tours led by California State Park rangers. The "Winding Stair" cave is considered dangerous and is closed to the public. The caverns are named after Jack and Ida Mitchell, who owned and operated the caves from 1934 to 1954 as a tourist attraction and as a rest stop for travelers on nearby Route 66. Four of Jack's buildings are still standing today. All were built by hand since there wasn't any electrical service here at the time. The Mitchells' native-stone house is now the Visitors' Center. Jack built three other guest buildings; two are also native-stone dwellings and the third is a small, rounded stone structure that Jack called "the Honeymoon Cottage." The rocks Jack used included geodes, petroglyphs, cavern limestone and limestone with fossils. It's a three quarter mile hike to the caverns. This is Andy, our ranger tour guide. This is the entrance to the caves, which was called "eyes of the mountain" by the Native Americans. 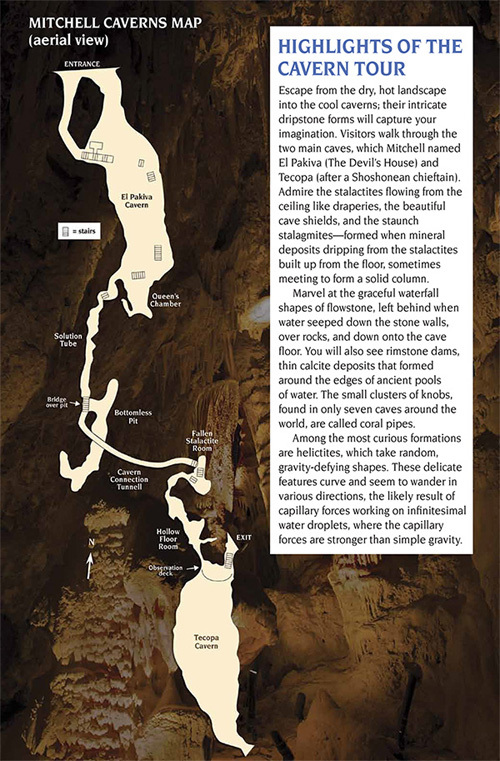 This diagram shows the layout of the caves. Without a tripod, I couldn't get a good picture of these great underground halls that are each about 90 feet long. Spectacular and intricate limestone formations found here include stalagmites, stalactites, helictites, lily pads, draperies, curtains and cave coral. It was a 400 mile roundtrip to get there and back, but it was worth it, since we've never seen anything like it.